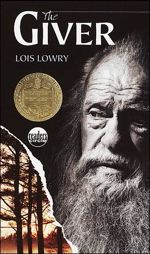 The Giver by Lois Lowry is a science fiction story about a future world that traps humans. To the people who created it and live there, it’s a perfect world. There is no pain, fear, colors or even music. There are rules for everything. Every December there is a ceremony where all the kids turn one year older, and get new things appropriate to their ages. The Ceremony of 12 is the last of these ceremonies. It’s the time when people turning 12 are given an assignment, a job for which they’ll train during their last years of school. This ceremony is taken seriously. The 11s are watched the whole year, so the elders will know which assignments to give them when they turn 12. Jonas is a boy from this world. He has known no real love or happiness. Of course he doesn’t even miss them, because his world is so controlled. His world is about to be shattered as he turns 12. At the Ceremony of 12, he is singled out and assigned to be the Receiver of Memories. He is to be trained by "The Giver," the old Receiver of Memories, to hold all the memories of the world. The memories are all life’s pain and pleasures, things he’s never felt or known. The memories allow Jonas to enter another world, one where he can feel emotions. At first, the memories are good ones. Then there are memories about war. He suddenly has all kinds of memories and feelings of pain and happiness. But what will Jonas do with them? I suggest people read this book because it’s funny and interesting. It’s entertaining to see how the author has created a world so perfect yet so creepy. It makes you appreciate the world you live in and the decisions you can make.